I had been enticed by the game when I first saw it announced back in May, but was slightly unsure how it would turn out. It is, after all, a game which was originally found on iPhone and Android. After my hands on, my fears have been swept aside. While I didn’t get to see the team management that will take place between races, I was able to dive into a full race weekend. The race weekend I experienced comprised one free practice session, one qualifying session and the race itself. The composition of the race weekends, and many other features, will be open to tweaking season by season. You will be able to vote on technical regulations changing race formats and tyre types (slow and durable, fast and high wearing), amongst others. So my racing experience at the show might not be the same as yours once you delve into the in-game politics. It certainly won’t be if you choose to start your career in the lower formulae. The EGX demo allowed you to choose any teams from the top tier of racing, in the full game you will have three tiers to choose from. Taking the weakest squad from the bottom European Racing Series to the World Motorsport Championship will be possible, with promotion and relegation between the tiers on the cards. You’ll have to ensure you get the right results though. If you choose a team, say the red team from Italy known as Scuderia Rossini with a German and Finnish driver setup, you might want to ensure you get some good results, or you might be for the chop. These are some of the elements of the game that appeal to me most, and Motorsport Manager might be set to show Football Manager a few tricks in spicing up the action outside of the big games. Back to my race weekend though where I chose to control Van Doort racing, a three star rated team who had a woman in the driving seat. Not having the official Formula One licence has some benefits, and allowing you to put a woman on the track is one of those. It has happened in IndyCar and WEC, so one day it should happen in Formula One. 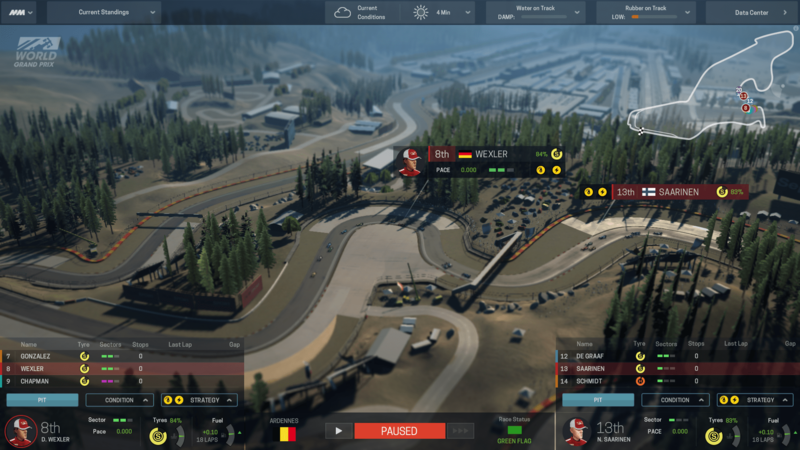 Before starting my race on the German track in Munich, I was able to decide whether my third driver would take part – I quickly dismissed him, but with different drivers offering different talents (and presumably money), it’s a feature which could lead to intriguing opportunities in the full game. I set my drivers out on different strategies, one would try out the soft tyres to optimise their qualifying performance, while the other used the medium tyres. A weather forecast widget is placed at the top of the race day screen, along with information on how much water is on the track. Not information I had to worry about…for now. As my drivers completed their target stints, they reported back on the balance of the car. You can get into a decent level of nitty gritty with the car setups, wing angles, suspension stiffness and gear ratios are all present for you to play with. The technical settings don’t go into the level of an Assetto Corsa, but they’re enough to keep you focused on delivering the right car for your drivers. And remember, not every driver likes a car to handle in the same way. After hitting the fast forward button, I moved onto qualifying and watched in eager anticipation as my drivers pushed the cars to breaking point and qualified in the lower reaches of the top ten thanks to some last minute tweaking of their setups. Qualifying was a small success for a smaller team, and in the career is something that could lead to sponsors rewarding the team for the effort. Onto the race, and I was conscious that others around me were eager to play this immersive management simulation, I had already been playing for quarter of an hour by now. If I was in the comfort of my own home, I would have taken the time to look at my opponents’ tyre strategies, along with a weather forecast, before setting off to the grid. Nonetheless, I bolted on a new pair of soft tyres to my cars, and waited for the lights to go green. As my cars whizzed by, I left the fast forward button on. It meant the 19 lap race went by in reasonable time, but meant that I missed out on making some strategy calls that could have secured me a podium. There are several sets of timing screens to flick through, everything from sector times to current tyres and the weekend tyre allocations. Fortunately, the race is paused while you inspect these screens in detail so you won’t miss a big shunt or important overtaking manoeuvre. If I had kept track of the weather better, I could have made an earlier call on moving to intermediates when the rain started to fall, but I took the gutsy call to pull one driver in for full wets, while throwing inters on the other. As the race unfolded and the track became ever wetter, the excitement ratcheted up a notch as I prayed neither of my drivers spun off. Soon enough, the rain stopped and I had to make the decision on changing to slicks just as a dry line started to appear in the last third of the race. Prompts appeared during this period of the race with my drivers crying out that I had changed their tyres too early. I was unrepentant and left them out to dance through the remaining puddles. When the race became fully dry, one of my drivers started to complain that his brakes were feeling fragile. If I was playing a career mode in a longer race, I might have called my man into the pits to retire, but with the race nearing the end, I asked him to tone down his race strategy. There are different options for managing tyre wear and fuel usage, and as he dropped off the pace to keep his car alive, I elected to use team orders, telling him to let his team mate through. By the time the flag fell, my drivers finished in similar positions to where they started, a fair result as I wasn’t paying as much attention to the strategic situation as I should have been. The level of detail in the race weekend though is enticing and appeals to the F1 and management sim geek in me. I didn’t notice anything at the time, but it would be interesting to see if you can let your engineers take control of the car setups or pit strategies. Of course, the races are only half of the package, and it is other side of the team management which I am now really keen to get my eyes on. 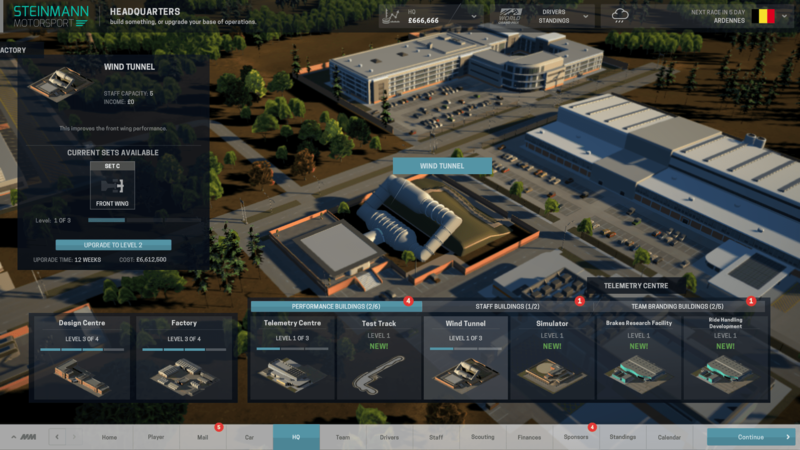 I loved the R&D elements of Grand Prix Manager 2, and the potential with Motorsport Manager to sneak illegal parts onto the cars is something I am raring to try out. Some people might bemoan the lack of an official Formula One licence, but without it, Playsport Games have so much more freedom to create a user friendly game. Moving between the three championships, influencing the rules and the intricacies of driver management? Bring it on.